Saiyans are known for their boundless strength and power, as well as their ferocity in combat. Saiyans thrive on it. They breathe it, and have it in their blood. Many Saiyans actually resemble each other to a great extent. This resemblance can sometimes denote a warrior who is "lower class" than other warriors. Saiyans are truly a race to be feared in any combat situation. Personality: Saiyans can adapt both physically and mentally to any combat situation. A Saiyan has no fear in combat; in fact fear drives the Saiyan into a rage. Saiyans also tend to have a supieority complex. Saiyans tend to live about as long as humans but sometimes they live a bit long. Saiyans are also known to be expensive mercenaries. Physical Description: Saiyans typically stand from 5' 7" to over 7', and usually weigh from 135 to 300lbs. Men are usually taller than women, as well as being heavier and with more muscle mass are. There is no such thing as a fat Saiyan. Saiyans have little to no body fat. In their normal forms Saiyans have black or brown hair, and a long monkey like tail. Saiyans can interbreed with almost any race, mainly humans, and elves. These hybrids are usually a bit more powerful than the full-blooded parent. Saiyans rarely decorate their bodies with tattoos, and piercing. 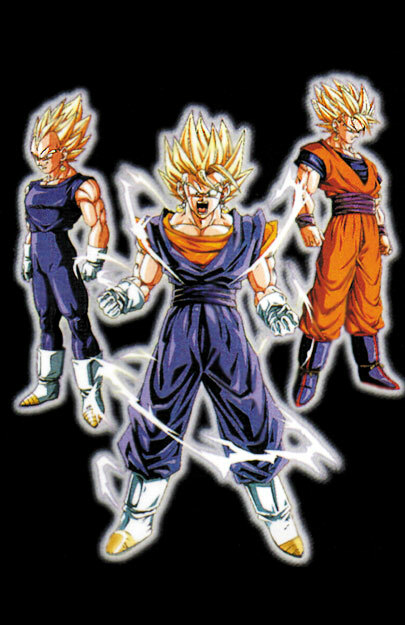 Saiyans also have the ability to transform into a Super Saiyan at will when they reach a certain level in power. This transformation is drastic and radical. The Saiyans hair stands strait up to some extent, and it turns blond, their eyes turn a bright green and they slightly glow. Relations: Saiyans are easily feared wherever they are heard of. Saiyans do look like any ordinary human, but the Saiyan's tail is usually a dead give away as to their heritage. Saiyans are also a rare race of beings and are difficult to find when you're looking for one, but they are around. Alignment: Saiyans tend toward being chaotic alignments. Saiyans can be any alignment, but rarely they are of any lawful alignment. Sayain Lands: Saiyans are always looking for the next battle to test their powers and skills. Saiyans rarely settle down in one spot, but are known to do so from time to time. Saiyans usually travel alone, but will sometimes travel in-groups of three or four. Saiyans hardly ever change the way they live. Training and combat are an every day thing. Saiyans are commonly found working as gladiators, or mercenaries. Saiyans do have nomadic villages that travel the countryside's training in different conditions. Saiyans also have a King that rules over all Saiyans. Religion: Saiyans do not worship any deity. God worshiping is looked upon as a waist of time. Time that could be spent training, or fighting. Saiyans do believe in the existence of Gods, but they don't openly worship any. If a Saiyan does worship a deity it is usually Kord, God of Strength. Language: Saiyans speak common. They can pick up on other languages when exposed to a culture long enough. Names: Saiyans tend to have unusual names. These names usually are based around the name of a vegetable. Such names would be Vegeta, Raditz, Kakorat, or Napa. These are typical Saiyan names, Vegeta however is usually the name of the Saiyan royalty, and Saiyans rarely have last names. Each name is unique. Adventurers: Saiyan adventures are usually the first ones to jump into combat. They tend to be ruthless in combat and give no quarter in a battle. Outside of combat they will train as to keep themselves in shape and ready of combat. Saiyans with a low intelligence score tend to be overly destructive, and will wine and complain if they can't "destroy" something every 5 seconds. Saiyans don't care about the gathering of wealth, only they're next battle. *+1 to Strength and Constitution, -3 Charisma, and -1 to Intelligence and Wisdom. *Medium Size: As medium size creatures, Saiyans have no special bonuses or penalties due to their size. *Saiyan base speed is 35. A Saiyan is unusually faster than any normal beings. *If the Saiyans tail is removed they lose the Ozaru Form ability. They also gain a -1 to Dexterity. If it is held and squeezed the character needs to make a fort save DC 20. Every other level past 4 offers a +1 to this save. Ifthey fail, all of their physical attributes are at 4 and their Speed is at 1. *Saiyans can use ki regardless of class. They get the Summon Ki Feat for free automatically. *Saiyans automatically start with the Ambidextrous Feat. *Saiyans are immune to the bites or scratches of any were-creature, and can not be turned into the undead, like a vampire. Considered a natural ability since Saiyans are already a were-creature of sorts. All of a Saiyans special abilities are considered to be Extraordinary Abilities except for Saiyan Hybrid and Saiyan Rage which are both Natural Abilities. *Ozaru Form: This is an ability that all Saiyans have. As long as a Saiyan has their tail, and they see the light of a full moon they have the ability to transform into huge ape like creatures. These creatures usually stand about 20+ feet tall, have glowing red eyes, and a long snout. When transformed most common Saiyans lose complete control of them and run about in a blind rage destroying anything or anyone in their path. The character can make 1 Will saving throw dc 20 to try and remain in control, but the character is at a -4 to the save. After level 5 the character gets a +1 to the saving throw every other level. The character can be forced out of the form by either cutting off the tail, (a called shot), block the light of the moon, or kill the character. Strength is at a +6 when transformed the characters speed is at a +5. The character becomes a gargantuan creature, and they gain all benefits for that. The character in this form gains a +10 to their HP plus another 10 every level. All Saiyan characters start with this ability. A Saiyans tail will naturally regenerate with in 5 years after it is cut off, or someone can magically restore or regenerate it. *Consent Growth: Unlike the normal rule of gaining 1 point to be added to any attribute every 4 levels, Saiyans gain 3 points to be added to their attributes. The points can be distributed anywhere amongst the attributes, but 2 points must go into their physical attributes. No Super Sayan If no KI allowed. *Super Sayain: When a Saiyan reaches a sustain point in power they are able to transcend their normal physical form and become a legendary warrior in their race (must also take the feat 1). The Super Saiyan is a legendary status amongst the Saiyans. In the past this status was difficult and virtually unobtainable to reach, but recently the status has become a bit easier to obtain. When the character transforms its is instantaneous. Their hair stands strait up turn's blond, and their eyes turn an almost glowing green. The character also seems to constantly glow with energy, gives off a yellow glow. Whenever the character generates a blast field for any reason its color is yellow as well. The Super Saiyan transformation adds a + 3 to Strength, and Dexterity. They gain a +5 to their HP for every level the character is. The character gets a +1 to their AC, their speed gets a +6, and they get a +30 to both powering up and power level. It takes 5 ki to transform at anytime. The transformation can be maintained for the characters Level in rounds, maintaining it will cost the character another 5 ki plus any damage that they have taken. If the character HP falls below 6-10 the character will automatically revert back to normal regardless of how much ki the character may have at their disposal. The transformation also has different levels to it. The level 1 transformation, the initial beginning one, is gotten at level 6. The level 2 transformation is gotten at level 10 (feat 2). This gives a bonus to the level 1-transformation bonuses. So when the character transforms in to the level 2 form they will get to use the combined bonuses of level 1 & 2. This gives a +6 to Strength. They get a +20 to HP and a +50 to their power up and power level. The character also gets a +1 to their AC, but their speed drops by 15. The cost to transform and maintain is at a +5. In this form the character gains more muscle mass, and their hair become wilder looking, beyond that their appearance is exactly the same as level 1. The level 3 transformation is gotten at level 14 (feat 3). This also works by giving a bonus to the level 1 bonuses. The level 2 bonuses are not used for this. The character gets the combined bonuses of these power levels 3 &1. They now get a +4 to Strength, and Dexterity. They get a +30 to HP and a +60 to their power level and power up. Their AC is +1, and their speed is +12. The cost to transform and maintain is +10 ki. In this for the character gains some muscle mass, and their hair becomes 20 times longer than it normally is, and they lose all or any body hair including facial hair. The hair on their head stays of course and the character gains something of a neaderthalic look to their face. Other than that the characters appearance is the same. The level 4 transformation is gotten at level 18 (feat 4). Once again this power gives its bonuses on top of the level 1 bonuses. The level 2 & 3 bonuses are not used. This is the ultimate transformation for the Saiyan. In order to use this power to begin with the Saiyan must have their tail. In this ultimate form the character gets a +6 to all of their physical attributes. They get +35 to HP, and +70 to their Ki. Their AC is +2, and their speed is +15. The cost to transform and maintain is +15 ki. In this form the characters appearance is drastically changed. Their hair stays black or brown, but it grow out to triple its normal length and has a wild look to it. The character also gets reddish brown fur all over their body except on the hands, feet, chest, and head. The character eyes become red rimed and the eyes turn gold. The character is also immune to the moon effects. Super Saiyan Penalties: While in the Super Saiyan form the characters Intelligence drops by a cumulative -1. This symbolizes the increase in violence of a Saiyan. At level 1 they get only a -1 to their Int. At level 2 its now a -2, at level 3 its -3, and at level 4 its -4. There is no cost in HP to transform. *Saiyan Rage: This power is exactly like the Barbarians ability to rage. Sayains can only rage once per day regardless of level. The bonuses and penalties for raging are exactly like that of a level 1 barbarian, but a Saiyan will only remain in their raged state for 1d6 rounds. Last of all while in their raged state their power level is maxed until they drop out of Saiyan rage, however powering up still costs 1 HP (+2 every other level), only now in just one power up they are at full power, they loose half of anything they have left when exiting out of rage. Saiyan rage can only be entered after 2 rounds of combat and the character has taken at least 5 points of damage, or their HP is at or below 4, (gets a +1 to the 5 and 4 every level.) See page 25 in the Players handbook for details on raging. Also the effects of Burn Out do apply if the Saiyan rages and is at 4 or less HP when powering up. *Flight: The character can fly at a speed off 90ft in any direction at 3rd level. The character can descend at double that speed. The Saiyan can take to the air as many times as they like. How ever if their HP (wp) falls to 5 or lower the Saiyan does not have enough strength to become air born. They can remain in the air for their constitution times 5 in minutes. If they are attacked in the air and hit for double damage they are knocked out of the sky, the Saiyan gets to make a Will saving throw to keep from falling out of the sky dc is equal to damage done to them. When falling the character takes 1d6 damage every 10ft. The character gets to make the save every 10ft. The character maneuverability rating is perfect. The character must make a Will check, DC 10 to become air born. This check is made after every 5 minutes of the character in flight.